Your selection of food can hugely impact your overall health as well as fertility. 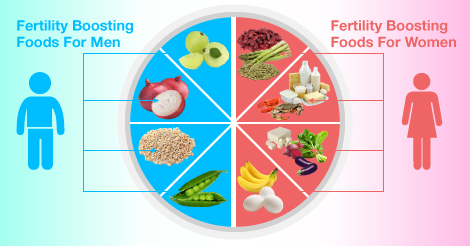 The couples who are planning to conceive or have any infertility issues must surely include the below given food items in their routine diet in order to get promising results. Both the Ayurveda and the modern medical science has recognized the importance of amla as fertility booster. Amla or gooseberry is high in vitamin C content which is a natural anti-oxidant. Regular intake of Amla improves sperm count and mobility. According to Ayurveda, men who wants to become father must consume one whole raw onion every night in dinner. Other than been strong aphrodisiac, onions are rich source of mineral selenium. Selenium prevents degradation of sperms by free radicals. It is also known to prevent damage to the chromosomes of the sperm and thus prevents birth defects. Urad dal has been compared to non-veg by Ayurveda due to its high protein and mineral content. Urad dal helps to improve fertility by reducing ‘vata’ in the body. Peas are rich source of zinc. Zinc improves sperm quality and mobility and sperm count. It also improves male libido. All these foods are rich source of folic acid. Folic acid is essential for regular menstrual cycle and ovulation. Appropriate blood levels of folic acid reduce the chances of ovulatory failure and thus improves the chances of conception. However, women who wants to conceive are strongly recommended to take folic acid supplements. Both these foods are a very good source of vitamin B 12. Vitamin B 12 reduces the fluctuation in estrogen levels and also helps in proper implantation of fertilized egg. It also strengthens the endometrium lining and reduces the chances of miscarriage. These foods are loaded with iron. According to studies, 60% of women with low hemoglobin levels are affected with infertility or recurrent miscarriage problems. Iron is important for maintaining proper egg health and timely ovulation. vitamin B6 present in bananas is crucial for proper egg health, regular menstrual cycles and ovulation. Eggs are rich source of vitamin D. Studies suggest that 93% women with vitamin D deficiency are infertile and many of them have ovulatory disorder named PCOS (polycystic ovarian syndrome).